Fusion Fascination, Sarina and Zahia perform a balanat finale at No Shame Eugene June 2016. Italian and Tango music at No Shame Eugene with red fans and in red cabaret style costume. 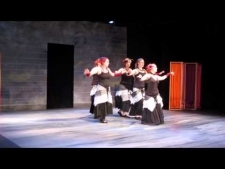 Sarina Performs a Tango, Flamenco, Gypsy Influenced Piece at the Middle Eastern Dance Guild of Eugene show. 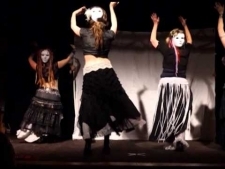 Sarina Performs Tribal Fusion at The Empress: Dance of the Tarot at Cozmic Pizza in Eugene. Tribal Fusion Steampunk Belly Dance With a Little Humor at Cozmic Pizza, Eugene. Sarina of Belly Dance Eugene performs at No Shame to soundtracks from Frozen and Game of Thrones. Sarina's student troupe, Fusion Fascination, performs to Phantom of the Opera at MEDGE's alternative show--Cozmic Pizza, Eugene. Improve fitness and core strength while working out to great world music and learning the basics of belly dancing. Class emphasizes posture and stretching to avoid injury, muscle isolation for improving strength and repetition for a balanced workout. Sarina teaches classes at Willamalane in Springfield and the Reach Center in Eugene. 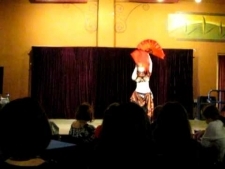 Sarina performs her alternative tribal fusion belly dance style at many venues in Eugene and sometimes Portland, Oregon. 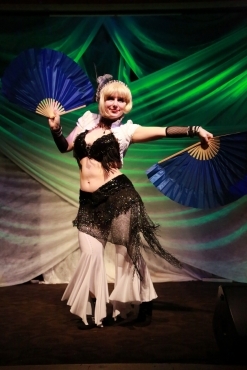 Whether she is steampunk belly dancing to neo-Victorian music, using her flamenco/burseque fusion fans with a 1920's flair, gypsy skirt twirling, clowning it up at Cirque du Eugene, or fusing break dance and belly dance to a Star Trek remixed music, she brings creativity and fun to the dance.